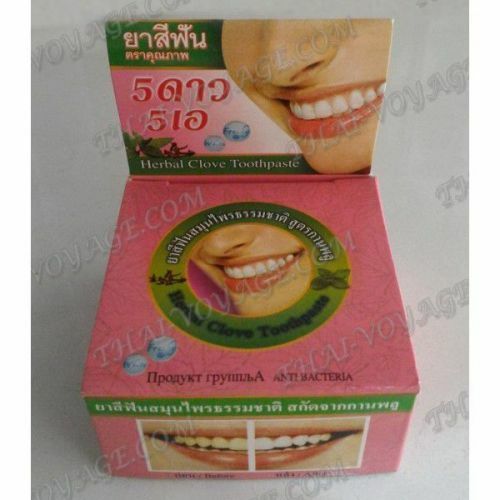 Round Thai organic toothpaste containing a part of Thai mint, clove, borneol, camphor and salt, very effectively whitens teeth, freshens breath, and eliminates dental plaque. The peculiarity of Thai mint toothpaste - it's a great refreshing effect, by a member of the Thai pasta peppermint extract. Toothpaste "Mint and Cloves" relieves inflammation of the gums, strengthens the gums, reduces the sensitivity of tooth enamel and perfectly refreshes the mouth. Thai Mint round pasta is very good cleans the teeth, whitens the tooth enamel and freshens breath. Application: remove the sealed jar, completely free from its protective film, then with a dry toothbrush do some stroking circular motions on the surface of the paste so that the villi in the toothbrush formed a small plaque. This small amount is sufficient to perfectly clean and protect teeth. The great advantage of the Thai toothpaste Mango is its efficiency. One jar of toothpaste is enough for 2-3 months of regular use. Do not allow water in a jar with pasta. Do not forget to close the jar after each use.